Asparagus or green beans came into our diet relatively recently. However, it undeservedly neglected, perhaps not knowing about all its useful properties, or cooking recipes. At the same time green beans are rich in vitamins of groups A, B, C, E, there is a large amount of mineral substances (magnesium, folic acid, calcium, iron, chromium). Contained in this beans amount of fiber improves gastrointestinal tract, eliminates toxins from the body, so the green beans recommended to eat during a diet. The best way of cooking asparagus is steamed. Wash, cut the bean culture into several pieces or boil them whole for several minutes. Then use the beans at your discretion. The finished beans salt, pepper to taste, sprinkle with lemon juice. Roll the pods in breadcrumbs. You can take crackers, mixed with your favorite spices. Fry for 1-2 minutes on high heat. 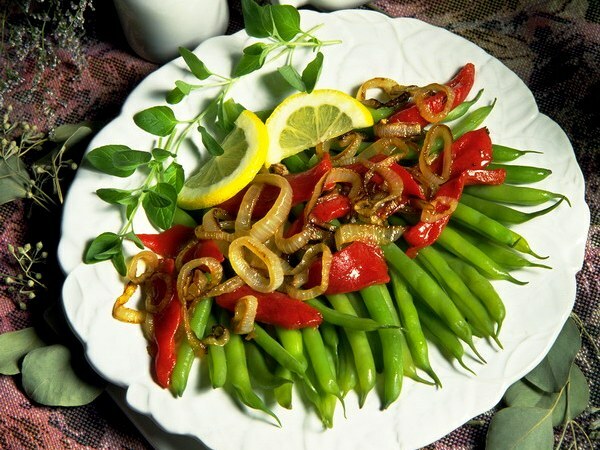 Wonderful side dishes mixed vegetables – steamed green beans, carrots, cauliflower, green peas season with salt, drizzle with olive oil, sprinkle with chopped herbs and serve, for example, meat or fish. Combinations of vegetables can vary according to your taste and imagination. Boil the beans and cut into pieces with a length of about 3 cm. Cheese grate on a coarse grater. In a salad bowl put layers of beans and cheese, sprinkling each layer with mixture of olive oil and lemon, you can sprinkle crushed nuts. Combine the beans, roasted chanterelles, finely chopped tomatoes. Dress the salad with mixture of olive oil, minced garlic, greens. Place on lettuce leaves. To preserve rich green color, cooked beans immediately dip in a bowl with ice water or with ice. With the approach of spring the body lacks vitamins, it is therefore necessary to skillfully use the diet all the available food. Easy to prepare recipe will not require a large number of ingredients will help to replenish the body with essential vitamins. To cook vegetables to cook, wash, trim the tails of the beans, peel and finely chop the onion. Better sweet pepper cut into strips. Place the green beans in boiling water for 2 minutes. After boiling strain the beans in a colander, cool with cold water. After the beans cooled, chop it into strips. On a hot frying pan place the chopped onion, pepper and beans, cook 5 minutes stirring constantly, then add the tomato. Add salt, pepper to taste, chopped garlic. After 2 minutes, break the eggs and stir the dish, cover, leaving over low heat. Wait another 3-5 minutes and your dish is ready. In order to improve taste properties of food and to increase the usefulness, use olive oil. Serve with rice, pre-garnished with greens. Asparagus or green beans is a low calorie and high in vitamins. It can be added to omelettes and stews, baked or steamed, to use for soups and fillings for pies. 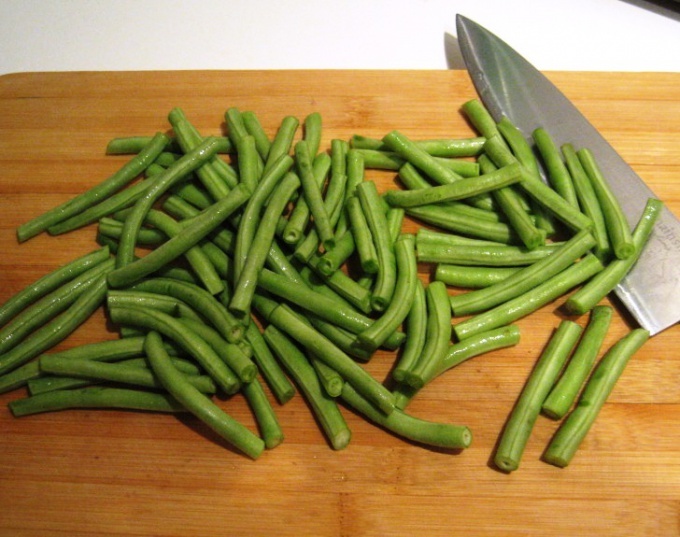 Two handfuls of green beans, wash, cut into slices, boil in salted water, drain and cool. 300 g canned tuna, cut or mash with a fork. Two slice of ripe tomato thin slices, a bunch of chives chop. On dish put a layer of beans, top place the pieces of tuna and tomatoes. Salad drizzle with olive oil, season with salt, sprinkle with pepper and chopped chives. This hearty omelet can be served on Breakfast or dinner. Onion finely chop and fry until Golden brown in hot olive oil. 100 g of ham cut into strips 2 potatoes chopped in cubes. Remove the skin from 3 tomatoes, rinsing them with boiling water. The pulp coarsely chop. Large sweet pepper clear from the seeds and cut into squares. Tomatoes, ham, pepper, potatoes and a handful of green beans put in the pan, where grilled onions. Salt and pepper the mixture, pour into the pan 0.5 cups of dry white wine. Cook the mixture for about 10 minutes. 8 eggs, whisk and fry in a separate pan greased with olive oil. On the omelet put the vegetables and place the pan in the oven, preheated to 200oC. Cook the Frittata for another 5 minutes, fold in half and serve hot. 300 g green beans, boil in salted water, drain in a colander and let the water drain out. Slice the pods in small pieces. 2 cloves of garlic chop and fry in hot olive oil. Add beans. 2 ripe tomatoes, pour over hot water, remove the skin, remove the seeds. Coarsely chop the pulp of tomatoes and add to the pan. Add salt mixture, sprinkle it with ground black and red pepper. 500 g Farfalle boil in salted water, drain and put pasta to vegetables. Stirring occasionally, warm the mixture for 2-3 minutes, then arrange on plates and garnish with Basil leaves. Large chicken rinse, cover with cold water, bring to a boil. Remove the foam, the sunflower and boil the broth for 1.5 hours. Ready broth drain, remove meat to the bones and finely chop. Pour the broth into a clean saucepan and bring to a boil. 2 potatoes, peel, cut into cubes and add to broth. Reduce heat to simmer. Prepare vegetables. 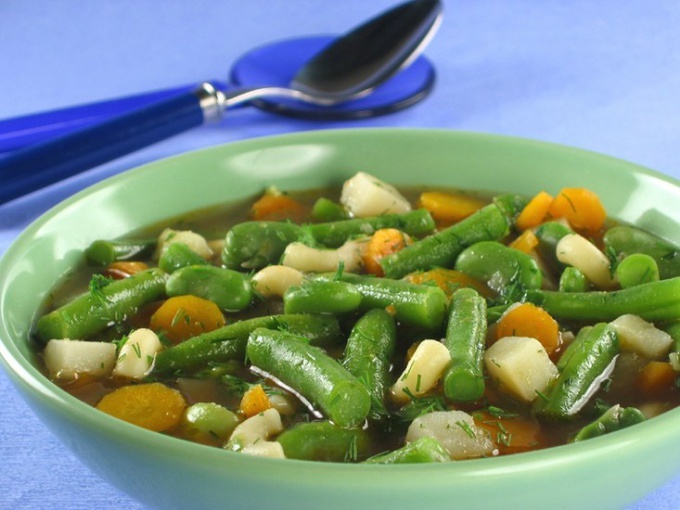 300 g green beans cut into small pieces, peel carrots and chop cubes. Onion chop. Large sweet pepper clear from the seeds and cut into long strips. Put the broth, onion, pepper and carrots, simmer for 10 minutes until cooked potatoes. Then pour in the saucepan the beans, cook for 3-4 minutes, add 150 g of green peas and sliced chicken. Turn off the stove and cover the pan. Leave the soup to stand for a few minutes and serve, sprinkled with freshly ground black pepper and chopped parsley.